Marijus Šmigelskis and Paul Robinson have been busy adding more classic testpieces to The Cinema at Topside. Marijus broke a hold on the "Cloverfield" project, the scar left a nicer crimp and allowed him to send the climb with a less reachy alternate sequence to the originally intended line which was rather morpho. Paul then used his height and strength to open the harder variation of the same climb, which he dubbed "Zodiac" 8A+. Lastly, to complete the lines on the boulder, Marijus opened "War of the Worlds" 7C. which climbs the first crux of "Cloverfield/Zodiac", but then heads rightwads to escape through a gap between the boulders. Paul then made good progress on the "Paranormal Activity" project, sticking all of the crux moves and establishing a stand start at 7C+. 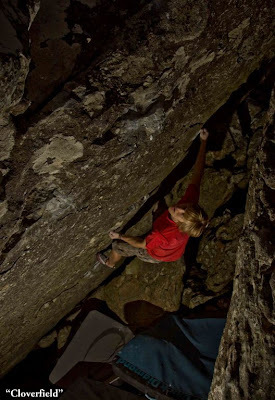 The full line is expected to weigh in around the 8B+ mark and Paul hopes to complete it fairly soon.